Oldroyd hits first field goal attempt of his career to win season opener. 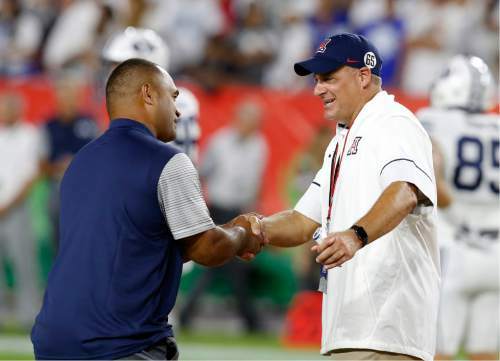 Glendale, Ariz. • It was far from a classic it was billed to be, but Kalani Sitake&apos;s first game coaching the BYU football team will be remembered 10 years from now for one thing. Oh, and Jake Oldroyd&apos;s game-winning 33-yard field goal with four seconds remaining. 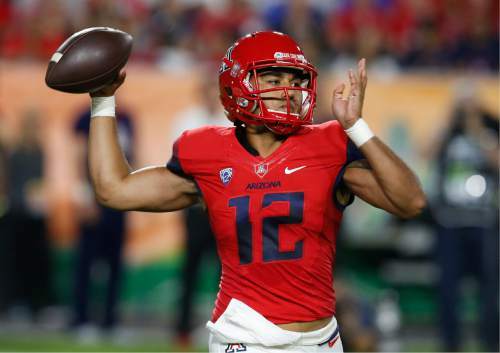 Overcoming plenty of opening-day sloppiness, the Cougars got the 18-16 win over Arizona after driving 53 yards into field goal range in front of 50,528 fans in the Cactus Kickoff Classic at University of Phoenix Stadium on Saturday night. Oldroyd is a walk-on who joined the team this summer after a tryout. 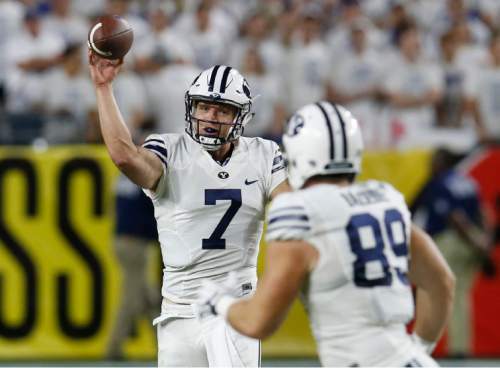 Nick Wilson&apos;s 49-yard touchdown run with 1:26 remaining was almost the difference, but the Wildcats left too much time on the clock for Taysom Hill. He took over with 1:20 left on the clock and completed a 23-yard pass to Moroni Laulu-Pututau to get the drive started. 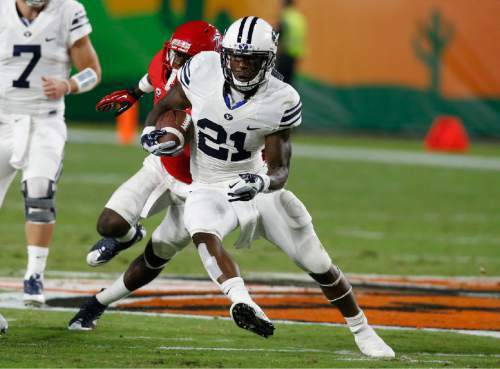 Hill finished 21 of 29 for 202 yards and a touchdown passing, while Jamaal Williams rushed for 162 yards on 29 carries. Arizona didn&apos;t score until six minutes remained in the third quarter, getting a 46-yard field goal from Josh Pollack to trim BYU&apos;s lead to 9-3. The nine-play, 69-yard drive on the Wildcats&apos; first possession looked promising until Corbin Kaufusi sacked Solomon on third-and-8. The Cougars blew several opportunities in the third quarter to give themselves a cushion. A 43-yard run by Williams to the Arizona 5 was negated by an illegal shift penalty, and they had to punt. Another drive to midfield was halted on 3rd-and-1 when Laulu-Pututau dropped a pass. Williams went over the 100-yard plateau with a 36-yard scamper at the end of the third quarter, and the Cougars finalized the drive with a 6-yard touchdown pass from Hill to Colby Pearson. The try for two failed, leaving BYU ahead 15-3. 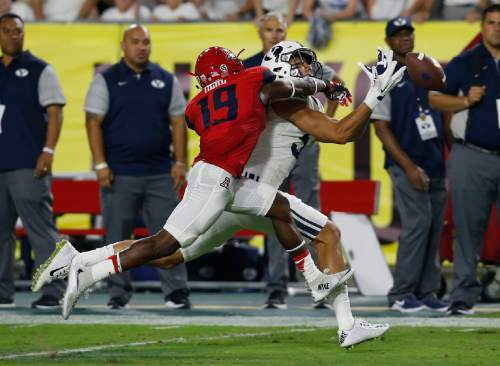 Then the BYU defense lost its edge, missing tackles and getting conservative, and Arizona drove 75 yards in seven plays to make it a one-score game. Wilson&apos;s 15-yard touchdown run cut BYU&apos;s lead to five, and after the Cougars had to punt on their next two possessions, his big romp nearly won it a quarter later. Stifled in the first quarter, when it gained 52 yards, BYU started to click in the second, and the Cougars took a 9-0 halftime lead. Francis Bernard&apos;s first career interception set the Cougars up at their 35, and they went 65 yards in 11 plays for their first TD of 2015, a plunge by backup fullback Brayden El-Bakri. Rhett Almond missed the PAT. Sitake was faced with his first big decision on the drive, going for it on 4th-and-1 from the Arizona 5. Algernon Brown picked up 3, and El-Bakri scored two plays later. 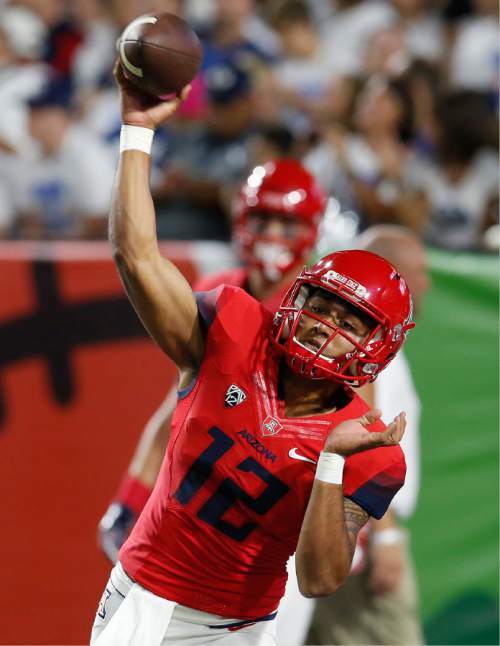 Arizona had just 107 yards in the first half, including minus-12 rushing yards. 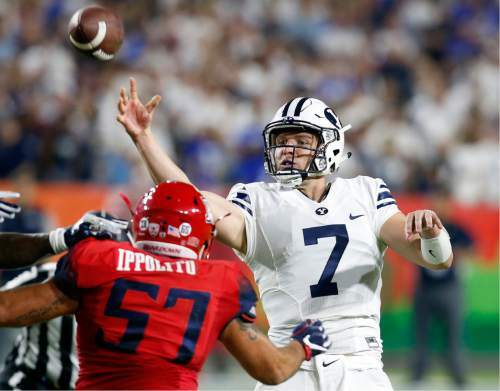 The Wildcats did mount a drive at the end of the second quarter, thanks to a pass interference penalty on BYU freshman Austin McChesney and a 21-yard reception by Nate Phillips, but Bernard sacked Anu Solomon on third-and-4 from the BYU 19, and a 52-yard field goal was wide. Neither offense got much going in the first quarter, which ended in a scoreless tie. The Cougars moved near midfield on their first two possessions, but Hill was sacked on third-and-9 to end the first drive and threw an incomplete pass to Jonah Trinnaman on the second series. 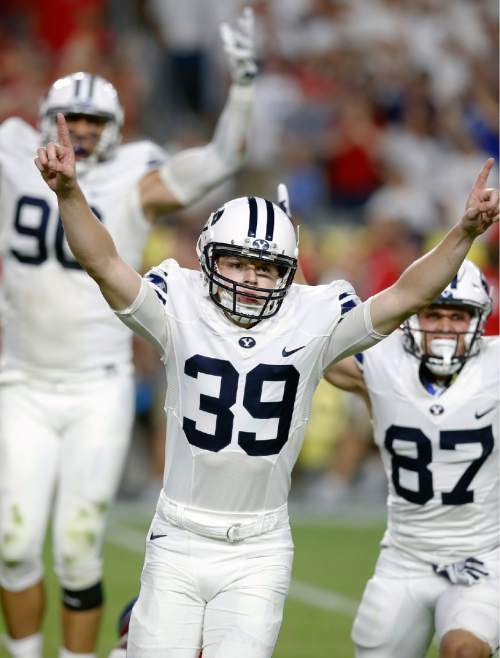 BYU&apos;s highlight in the first quarter was Jonny Linehan&apos;s punting; He pinned the Wildcats on their 1 with his second punt, and turned the field in the Cougars&apos; favor. 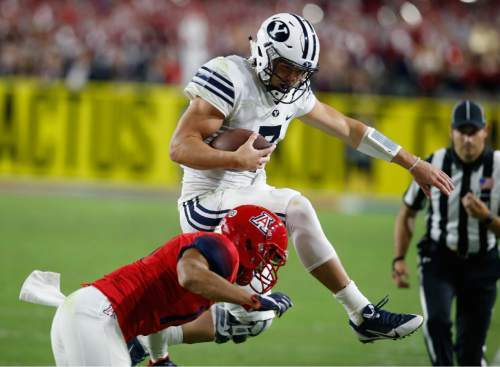 BYU had to settle for a field goal on its third possession, despite driving into Arizona territory. Williams, who had 78 yards on 12 carries in the first half, got close to the goal line on a 33-yard run, but Jonah Trinnaman was called for a block in the back on the run. Almond&apos;s line drive cleared the crossbar from 24 yards out, putting the Cougars on the board first. 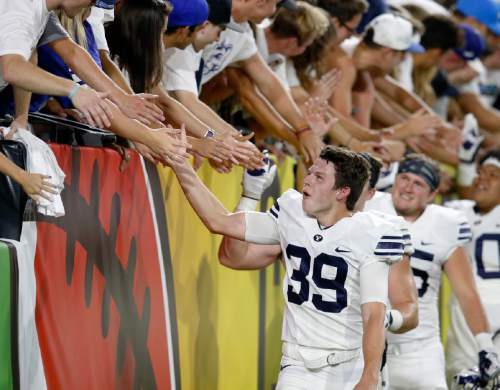 BYU&apos;s special teams did have better moments, however, including a 27-yard punt return by Garrett Juergens that set up the field goal, and Linehan&apos;s punting. R Jake Oldroyd&apos;s 33-yard field goal with four seconds remaining lifts the Cougars to the win. • The Cougars take a 9-0 halftime lead and led 15-3 in the second half before Arizona rallied.